The 10 complete short novels in this astonishing collection are by the most talented writers working in the 1950s—the decade when SF’s mass popularity exploded in novels, films, strip cartoons and stories. 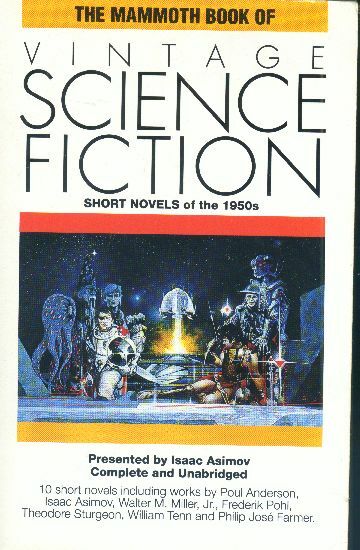 This is the third anthology of novellas in the series starting with The Mammoth Book of Classic Science Fiction, and while it’s better than that first volume, it isn’t quite as good as the second volume, The Mammoth Book of Golden Age Science Fiction. For one thing, I don’t like all of the stories here. Pohl Anderson’s “Flight to Forever” would have been fantastic had it been published twenty years earlier, and I don’t like Philip José Farmer’s “The Alley Man” at all. I don’t care how good it is—I can’t stand it, and any anthology including it is penalized by its mere presence. On the other hand, we do have Asimov’s own “The Martian Way”—an excellent story, but not one I would have chosen over “The Ugly Little Boy” or “The Dead Past,” which also qualified for inclusion. Frank M. Robinson’s “The Oceans Are Wide” is an interesting variation on the generation ship story pioneered by Robert A. Heinlein in “Universe.” “Second Game” by Charles V. de Vet and Katherine MacLean is excellent as is William Tenn’s “Firewater” (a rather forward-looking story for the 1950’s in terms of style and theme). The remaining four stories, however, are nothing short of incredible (and—dare I say it—even better than “The Martian Way”). One is Frederik Pohl’s savage “The Midas Plague.” Another is Walter M. Miller’s “Dark Benediction.” The remaining two are Eric Frank Russell’s “And Then There Were None” and “Baby is Three” by Theodore Sturgeon. Despite the inclusion of “The Alley Man,” then, this is a must-have anthology by any reckoning.